After our rejuvenating soak in the mineral hot springs, we headed north on Interstate 25 toward Socorro. Just before arriving there, we stopped at the Bosque del Apache National Wildlife Refuge. Driving along the loop roadway lined with Cottonwoods and willows arrayed in their fall splendor, we stopped frequently to view water fowl of various types. 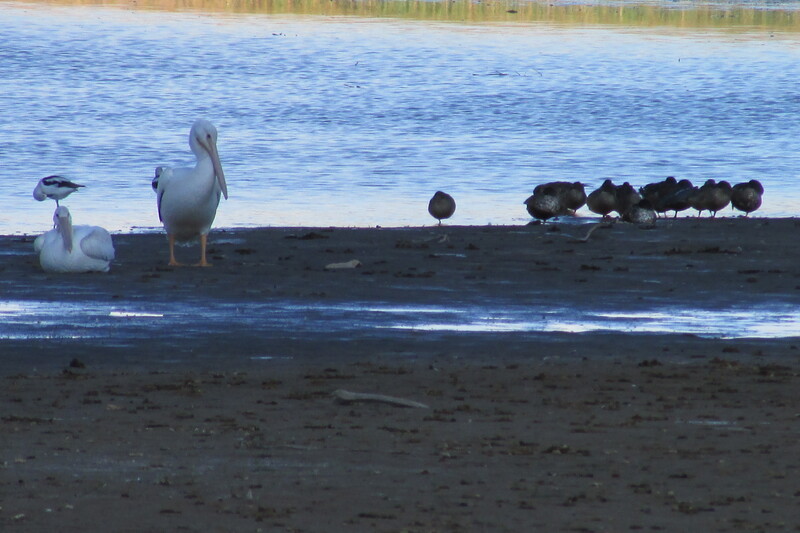 We observed geese, swans, and pelicans, as well as several varieties of ducks. 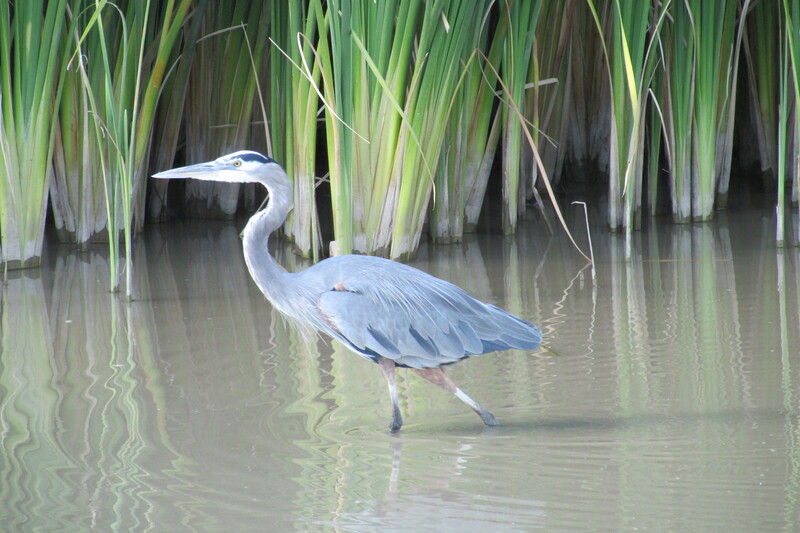 Walking out on the bridge over the marsh, we were fortunate to spot cranes, herons, grebes, egrets and ibis. The next day, we said goodbye to Socorro and started out on a road that had few travelers. 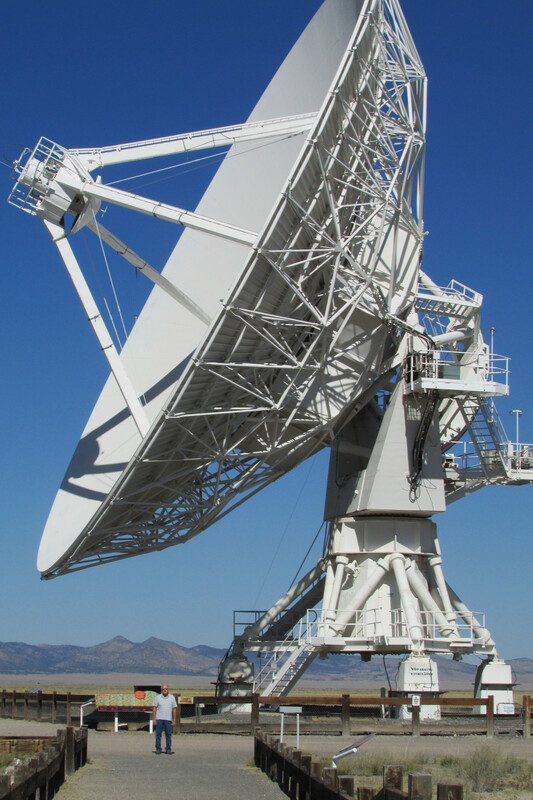 We were headed for a place that by design was in the middle of nowhere–the Very Large Array. 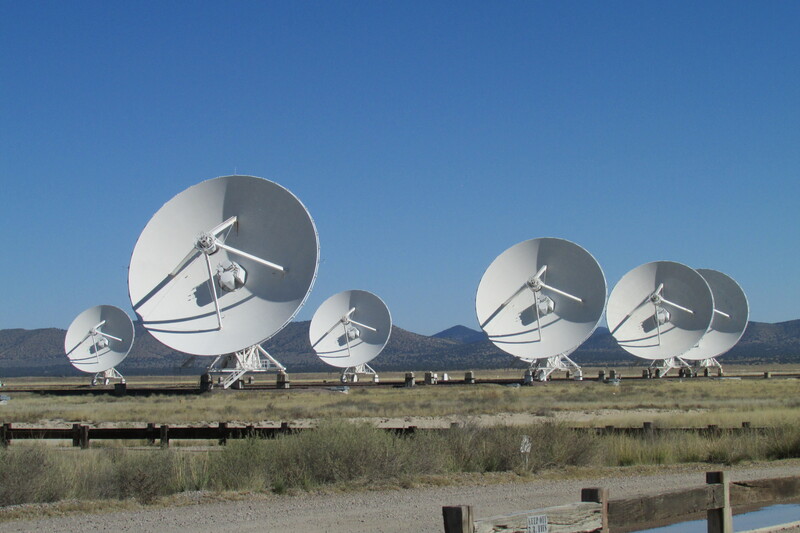 It is a collection of twenty-seven gigantic dishes that span twenty-two miles to pick up radio waves. Because radio waves are so long, it requires that great distance to receive the entire wave. By using radio waves, scientists are able to observe stars and planets in the making, as well as black holes not visible to us in any other way. To show how very large these dishes are, I asked my husband Craig to stand next to one. See if you can find him in the picture. On our way back to Silver City, we drove through the Gila Wilderness. It was the first designated wilderness area in the United States, proposed by Aldo Leopold in 1924. It seemed appropriate to be there as this year is the fiftieth anniversary of the Wilderness Act which preserves the more than 100 million acres of federal public lands. Our final destination brought us back to Arizona. On our way to the Chiricahua National Monument, we saw signs for Fort Bowie. Figuring, we might as well see it all, we followed the signs to a hiking trail that was a mile and a half long. At the end of the trail was Fort Bowie. Not wanting to spend the time hiking, we asked the ranger for driving directions. We able to take a dirt road that brought us to the site. 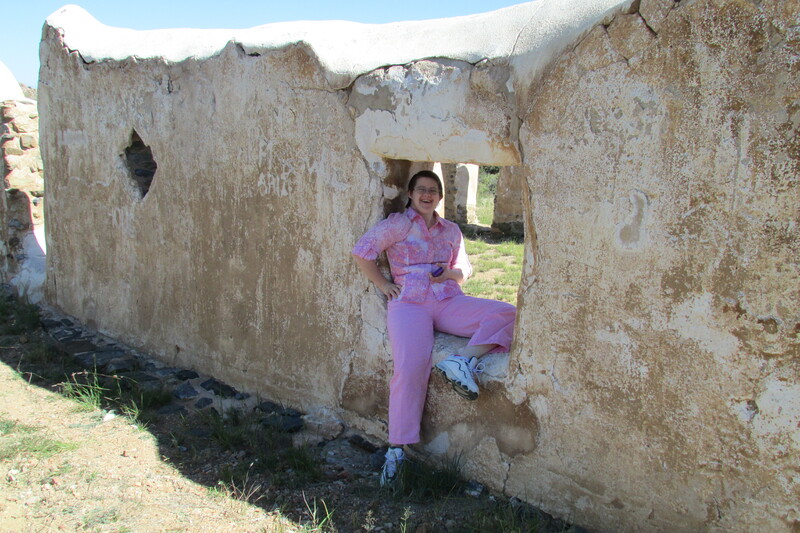 Most of the fort had fallen into ruins, but enough remained to spark the imagination. In its prime, Fort Bowie was the launching point for campaigns against the Chiricahua Apache, led by Chocise, and later by Geronimo. 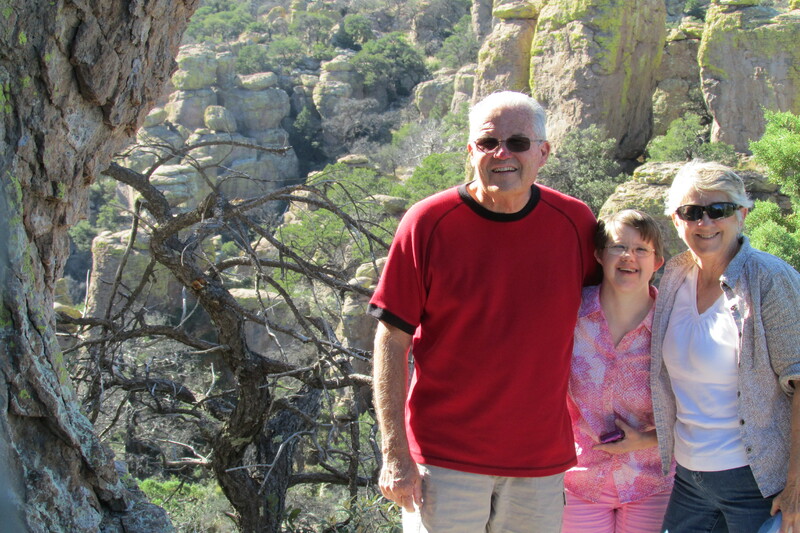 Continuing on with our original plan to visit Chiricahua National Monument, we discovered there is a dirt road that joins the two parks. 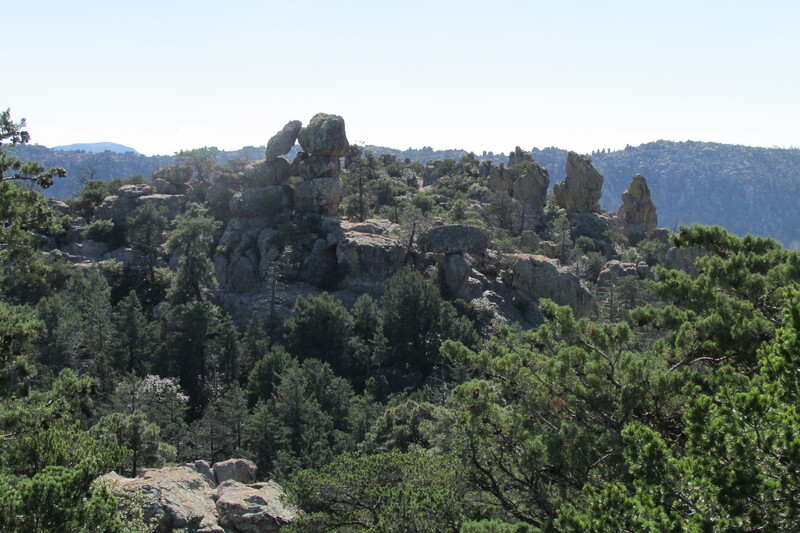 Chiricahua National Monument is what is known as a sky island–that is an isolated mountain range that rises up above the grassland sea that surrounds it. On roads originally built by the Civilian Conservation Corps during the Great Depression, the park provides a beautiful drive to the top, passing through forests of cypress, pine and fir. 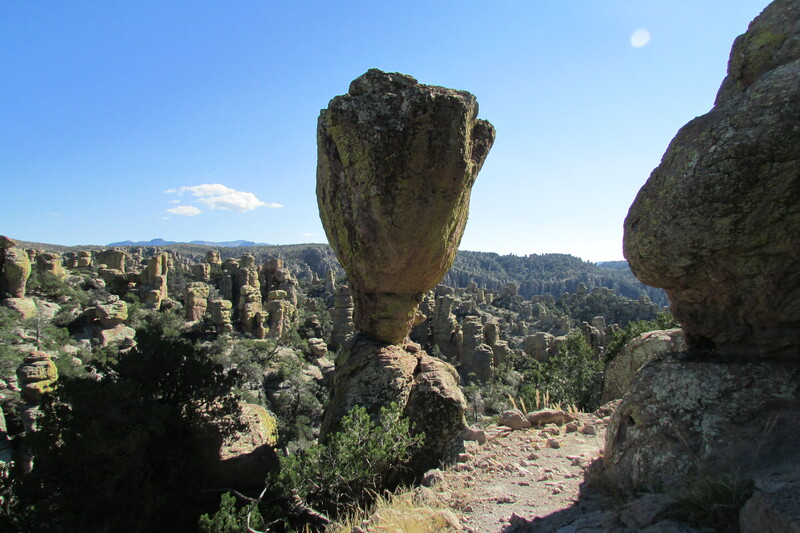 At the top, we were able to view what the Chiricahua call “standing up rocks.” We took a trail to a rock grotto for more great views. To the west, we could see the rugged Dragoon Mountains where Cochise had his stronghold. The mountains are named after the 3rd US Calvary who were called Dragoons. It was a regiment of infantryman who used a heavy carbine known as a dragon, a kind of short musket, instead of the usual sabre and revolver. Cochise died on a reservation, but his body was buried in the Dragoon Mountains. His men rode their horses over the spot until it was no longer visible. No one living knows where Cochise was buried. Tired, but happy, we returned home, thankful to all those who helped preserve the geologic and historic wonders we had been so fortunate to enjoy. Thank you so much for your kind words. I really enjoy writing posts for my blog. I hope you will decide to drop in again some time.